Nineteen-year-old contortionist Ren Putri is committed to circus, study and self-discipline – in that order. But after being rescued from a carnival fire by cardsharp Zep Deal, she’s overwhelmed by some highly disorderly thoughts. Zep has a history of trouble, and now he’s been suspected of sabotaging the circus that’s become his whole life. Ren is already coping with family, and keeping secrets of her own – but she can’t resist a mystery. Will Ren’s penchant for solving puzzles bring the case against Zep to rights, or will digging further into the bad blood between rival carnivals only put them both in danger? 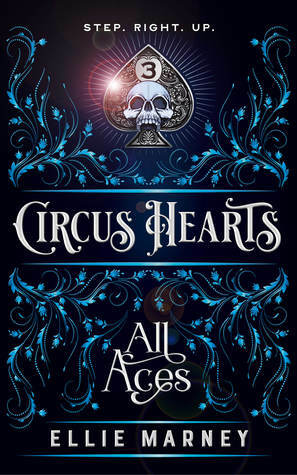 Dark YA romance, with a criminal twist – Circus Hearts: Step. Right. Up. 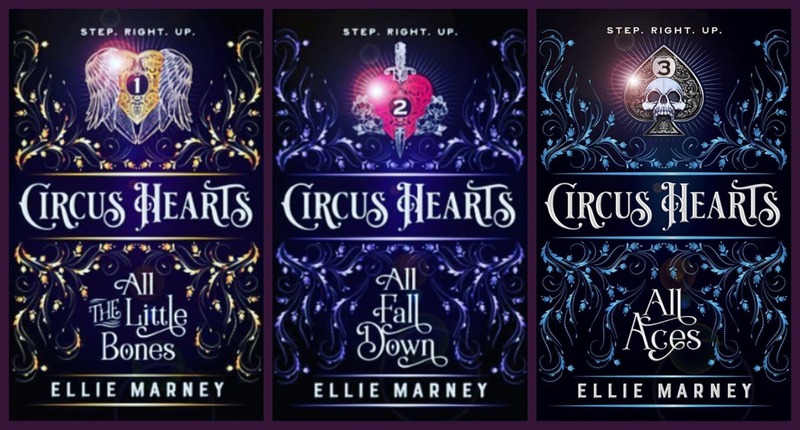 All three books are set in Klatsch’s circus, with the times lines of the characters’ lives continuing from one book until the next. That being said, all books could stand alone, but I think you would be doing yourself a disservice if you didn’t read them all and you may as well do that in order. I was captivated with this series right from the start. In book one I adored the POV character, Sorsha. With Fleur as the POV character in the second book it took me a little while longer get into the groove of the story, as I didn’t really like her in the first book, but I got there in the end. 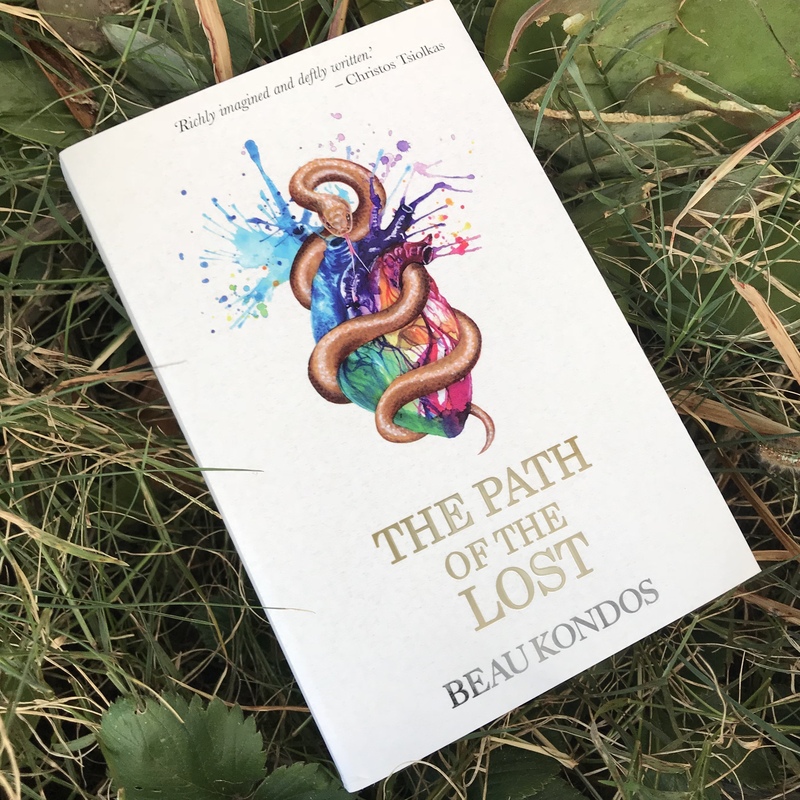 Ren is the POV character of the third book and I liked Ren right from the moment Sorsha met her in book one, so I connected with her voice immediately. Oh, adorkable Ren. Overthinking, overstressing, hardworking to the point of breaking, world on her shoulders and in desperate need of some good loving, Ren. And I can’t forget the other star of this instalment – Zeb! Delicious Zep Deal, with his A****** of a father and his dark past. I love me a bad boy who is trying to break free of his past and make good for himself. Zep made a fantastic love interest for Ren. 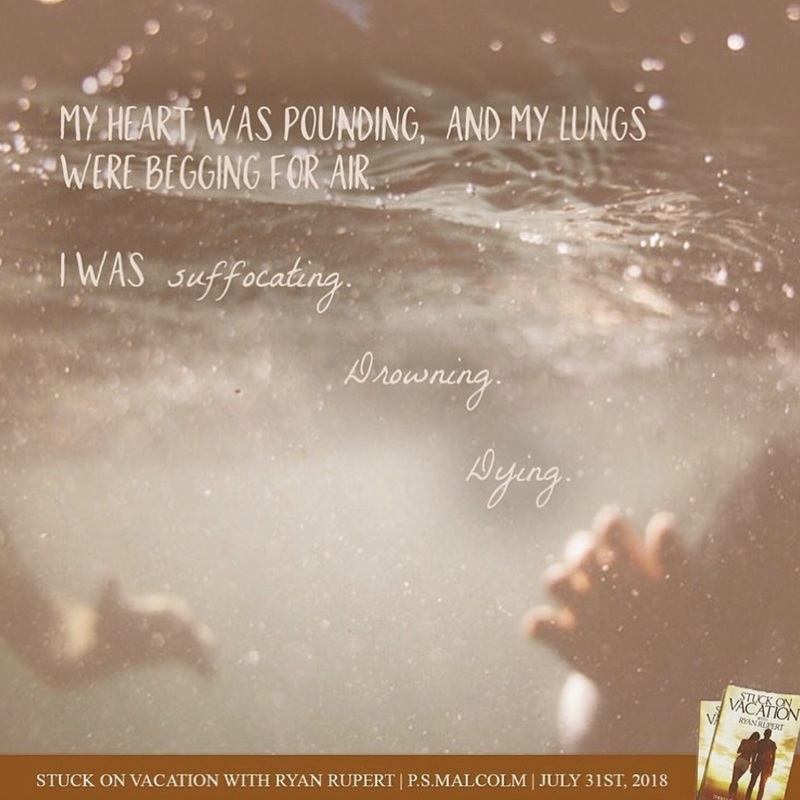 A connection of sorts sparks up between Ren and Zep rather early in the story. One good dead is returned for another, that then turns into a tentative friendship, that then develops into the two of them partaking in some sneaky and very risking business together, which leads to them falling hard for each other. Ren learns she has limits and how far she can push them. She learns how to stand up for herself and fight for the things she wants – she also learns what the things she really wants are. Zep gets the break he deserves and a good woman to help him heal his heart – aww. Damn, I’ve made this sound like its all mushy romance, but it not. There is plenty of action, punch ups with bad guys, revenge on the circus saboteur, and just more circus life in general! Yes All Aces has a rather adorable first love romance for Ren, but it also has a you-gotta-fight-for-the-things-you-want vibe going on the whole way through. We also get a conclusion to the circus saboteur storyline that has ran through all three books. I said this in my reviews for the previous books and I’ll say it again for book three as it still holds true – Fast paced action. Hot romance. Circus life. What more could you want people. Do yourself a favour and check the series out. Who would like this series: Fans of swoon worthy romance. 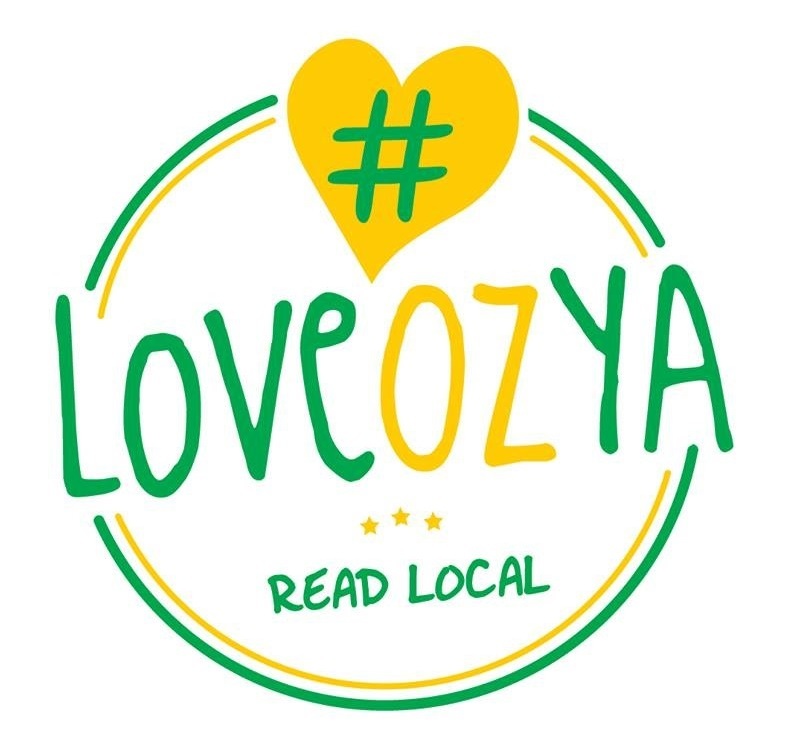 #LoveOzYA aficionados. 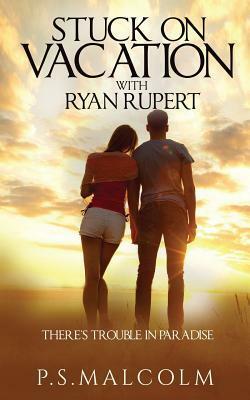 Anyone after a captivating and fast paced read. In the great city of Catifornia, the Meofia are by far the most feared of all the felines. At home, their baby sister Kat is enslaved under lock and key. Done with the constant abuse, she escapes, embarking on a perilous journey far beyond the land of cats. Lost at sea, Kat is captured by a ruthless gang of notorious pirate dogs and forced to the depths of the ocean in search of treasure; where she discovers an ancient city, lost in time. 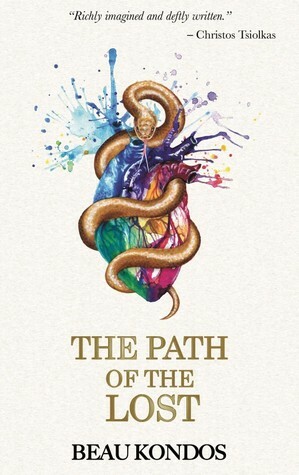 Here, Kat comes to terms with who she truly is – gaining the courage to fight for her life and freedom, to fulfil an ancient prophecy that she inevitably finds herself entwined with. A new style of book, a fusion of various parts. Adventure novel, graphic novel & picture book. I read KAT: THE LEGEND OF GNAWBONIA out loud with my five-year-old son Riley and was really impressed with how it held his attention. From start to finish he sat captivated. It took about an hour to read all fourteen chapters, but you could break it up into multiple reading sessions if need be. The story follows Kat as she tries to escape her abusive brothers, running as far away as she can. Cue a whirlwind adventure involving a bounty being put on Kat’s head, fearsome pirate dogs, a lost kingdom hidden underwater, unexpected allies and a monster of the deep. The story finishes with Kat having taught some old dogs new tricks, gained new friends, a new home, and freedom from her brothers. Fantastic. I love a good underdog story, or in this case an undercat story. I asked Riley if he liked the story and would like to read it again some time. He replied “yeah” with a big smile on his face. I asked Riley what his favourite part of the story was and he replied “when the cat got into the ocean and caught the octopus”. He then went on to ask me what was my favorite part was, to which I replied ”when Kat triumphed over the mean pirate dogs”. KAT: THE LEGEND OF GNAWBONIA reminded me a Dreamwork movie, but in print. The story and art had humour sprinkled throughout for the adults as well as the kids, and then there’s the resounding message of never give up. A top read and one I would recommend for ages 5+. 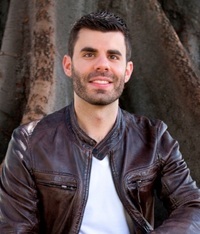 You can check you the interview I did with author Nick White HERE. In the great city of Catifornia, the Meofia are by far the most feared of all the felines. At home, their baby sister Kat is enslaved under lock and key. Done with the constant abuse, she escapes, embarking on a perilous journey far beyond the land of cats. KAT: THE LEGEND OF GNAWBONIA IS AVAILABLE AS A VISUALLY STUNNING HIGH-QUALITY HARD COVER (seriously it’s beautiful, congratulations on that) AND AS AN ANIMATED EBOOK. 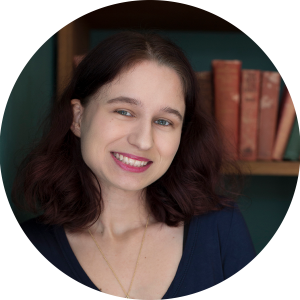 CAN YOU TELL US A LITTLE BIT ABOUT YOUR AND KAT’S PUBLISHING JOURNEY? Thanks Sarah. I did actually get accepted into a few publishing houses, but turned them down as they wanted full creative control of the book and in the end they pay fractions to authors. Although there’s a few risky pages in there I like everything I’ve put into the book and didn’t want it butchered by any company scared of offending few individuals to protect their reputation. So I funded the first print run through Kickstarter, it’s a great way to do it – if you can convince people it’s a worthy investment that likely won’t be fulfilled for a long time due to shipping problems and international banking issues. Hahaha. CAN YOU TELL US A LITTLE BIT ABOUT THE INSPIRATION BEHIND IT, OR HOW THE STORY CAME TO BE? I’ve wanted to do an illustrated novel for about 17 years, and what sparked that was that there just aren’t many around (there were none back then). I guess I then had to work up the courage to spend 5 years of my life on one single project. I was never really sure what the story was going to be but in the end when I put pen to paper I wanted the end of it to have an epic fight between a seemingly helpless and small-for-her-age cat, and a bunch of hungry beastly dogs. And I wanted the cat to come out on top. From there it was a case of reverse engineering the story; Why are they fighting? The dogs could be pirates. Why is the cat there? She could be their prisoner? How did she get there? She was lost at sea etc etc. Every answer would inspire a further question until the story was plump enough. IF YOU COULD GO BACK TO THE BEGINNING AND GIVE YOURSELF ANY ADVICE, WHAT WOULD IT BE? I’d tell myself to invest heavily on Netflix… then I could have spent the last few years working on my book fulltime and not through the nights in between my full time job. ARE YOU WORKING ON ANYTHING AT THE MOMENT, CAN YOU TELL US ABOUT IT? I am loosely working on the next volume of the book. It’s very exciting; it’s a straight continuation of the story. The last book I read was the Gruffalo. I have a 3 year old daughter. The last book I read for myself was James and the giant peach. I always wanted to read it when I was younger but never got around to it. Roald Dahl’s still got it! THANK YOU SO MUCH TO NICK FOR TAKING THE TIME TO ANSWER MY QUESTIONS! Nick has chosen to give 10% of all profits from the book to three international animal charities, Mercy for Animals, The Humane League and Animal Equality, who are doing essential work around the globe to eradicate factory farming – a theme the book lightly touches on. Nick is originally from Sydney, Australia, has spent the last 18 years as a commercial artist, lending a hand to some of the biggest ad and design agencies in the UK, NZ and Australia. Sabine isn’t like anyone else. For as long as she can remember, she’s had two lives. Every twenty-four hours she “shifts,” living each day twice. In one life, Sabine has everything: popular friends, perfect grades, expensive clothes, and the guy everyone wants. In the other, Sabine’s family struggles financially, and her friends are considered rebels. But then she meets Ethan. He’s gorgeous and challenging, and he makes her feel like she’s never felt before. All Sabine really wants is the chance to live only one life. But when this finally becomes possible, is she willing to risk everything – including losing the one person who might actually believe her – to make it happen? Published: 1st May 2013. #LoveOzYA Reading Source: Local Library. 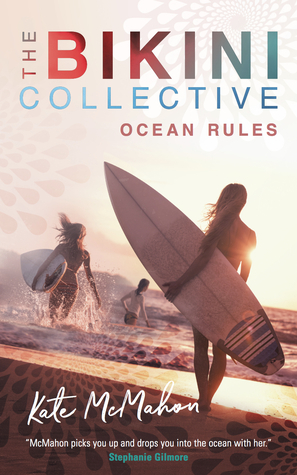 My Thoughts: I LOVED loved loved Shirvington’s Disruption duology, so I had extremely high hopes for the quality and my enjoyment for this book – and it lived up to them. I found this book to be super cute and easy to get into. I easily connected with Sabine and felt for her plight. 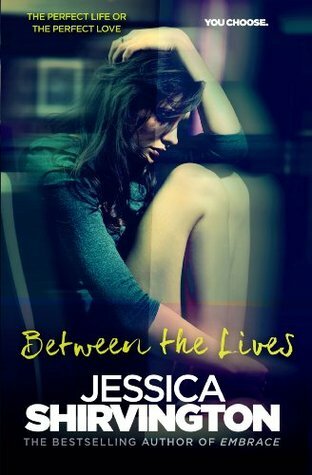 The love interest was to die for, or rather to live for (you’ll understand that if have you read the book) Between the Lives is the story of a young woman literally living two lives. *WARNING it’s a Tearjerker* Oh how I cried!! But the ending did make up for the tears, leaving me warm and fuzzy inside. Published: 18th October 2016. #LoveOzYA Reading Source: Purchased Paperback. My Thoughts: Bloody Brilliant! I LOVED it! No surprises there, I loved Illuminae. I’m only sorry it took me so long to read book two. The positive is that I don’t have long to wait for the third book, Obsidio 🙂 YAY! It’s out next month (13th March 2018). 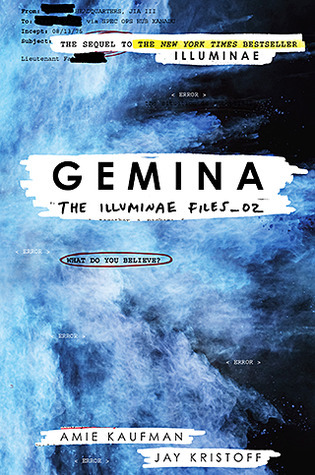 I love the way The Illuminae Files story is told, the way the books are set out. I think it makes them stand out from all other YA sci-fi. They are textual masterpieces. In this book we get to meet some new characters (I ship Hanna and Nik, and think Ella is the bomb) and catch up with some old faves (woop woop hello again AIDAN, Kady and Ezra). The BeiTech baddies continue their debauchery and the ending leaves you NEEDING the final book. Published: 21st February 2018. #LoveOzYA Reading Source: Purchased eComic. My Thoughts: Damn I love this series! Four issues in and I’m beyond hooked. Some of the boys are so sassy and snarky, I LOVE it. I’ve always been a sucker for an underdog story, but who would have thought I’d be a fan of fencing? 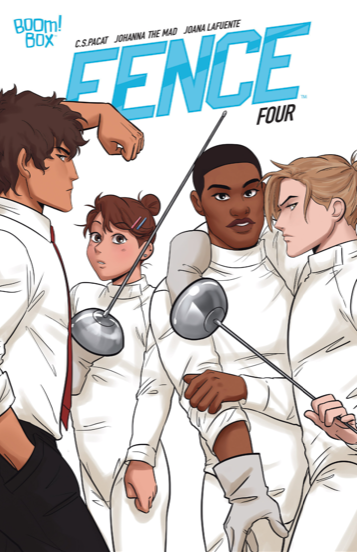 I really enjoy “watching” the fencing as well as the character interactions/relationships. Thank you C.S. Pacat – Awesome stuff. Finn, Kas and Willow have survived the winter of storms. Severe winds and cold have kept the Wilders at bay. Now that spring has come, everything has changed. They’re being hunted again, and they won’t be safe while Ramage wants their blood. 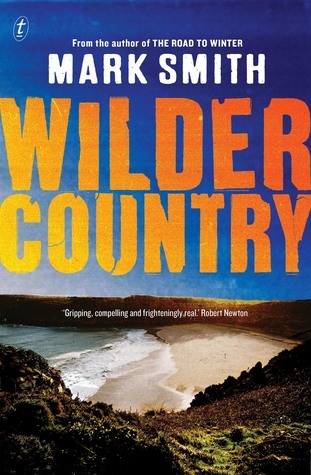 The lovely people at Text Publishing sent me a copy of Wilder Country and I’d hung off reading it as I had intended to purchase and read the first book first. Time was dragging on and ultimately, I decided to give this book a go without reading the first one. I’ve started other series with the second book in the past (by accident), loved them, and gone onto to read the rest of the series with no ill effect. While it was easy enough to pick up the pivotal events of The Road to Winter thanks to the aftermath of them in this book. I did struggle to form an emotional attachment to the characters. I am positive that this is because I’d missed all the character background and relationship set up from the first book. I really enjoyed the writing and the plot of this plausible dystopian world Smith has created and am looking forward to reading the third and final book, The Land of Fences. At the start of the book we get a snapshot of what life has been like in the abandoned coastal town of Angowrie for Finn, Kas, Willow and Rowdy over winter. Through Finns narrative we get a little bit of a recap of how ‘The Virus’ killed practically everyone in Finns part of the world and how everything descended into chaos with a vicious gang trying to rule over all that remains. Finn, Kas and Willow set out just as winter is ending to check on fellow survivor Ray, return Willow to her parents and track down and rescue Rose (Kas’s niece). What follows is a lot of compelling action packed high stakes drama. Even though the plot, the landscape, the action and character interactions were all top notch, I think my enjoyment was hindered by not reading the first book. Multiple times while I was reading this story (whenever Finn mentioned the previous winters) I found myself thinking ‘I wish I’d been with Finn through those winters’. And I would have, had I read the first book. Wilder Country is a story of survival. A story of keeping promises. 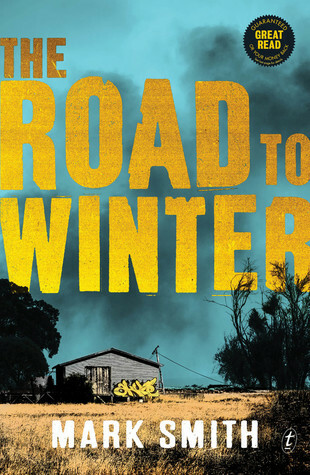 Do yourself a favour and go and read the The Road to Winter First, then come back and read this one. You won’t regret it. Marsh and Me is a story of friendship, family, social and self acceptance and the healing power of music. The story is told from Joey’s point of view (the Me part of the title). Joey comes from what I take to be a middle class white australian family. He is a sensitive, thoughtful and caring boy. Joey begins the story full of self doubt, not knowing where he fits in the world or who he wants to be. Joey has his hill. His oasis in a world where he doesn’t feel he fits. March turns up on his hill. His peace is shattered. His sanctuary invaded. Marsh (or Ruzica) is stuck in the in-between, she is both Serbian and Australian. Born in Australia to migrant parents, she’s never felt she belonged in either place. As her father struggles to cope with the loss of her mother, March seeks shelter. She builds a fort on a hill to hide away from the world. Marsh is stand-off-ish at first and scares Joey away, but he preservers and a friendship that they both benefit greatly from grows. As the story progresses we get to see Joey’s friendship help March and her father start to heal. And we see Marsh help Joey believe in himself and attempt things he always wanted to, but was too afraid to do alone. We get a little taste of Serbian culture and music through Marsh and her father. And it was wonderful seeing Joey learn about Marsh’s family’s migrant experience and learn to understand and feel their pain – a fantastic lesson in empathy the MG audience won’t realise they are getting. Joey’s family are supportive of the friendship and completely accepting of Marsh and her father. 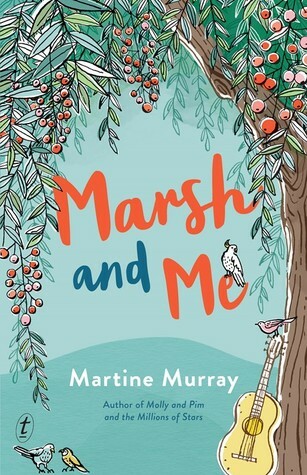 Marsh and me is a beautiful and powerful story that I think is a must read for all Aussie primary schoolers and Aussie MG/ #LoveOzYA aficionados. 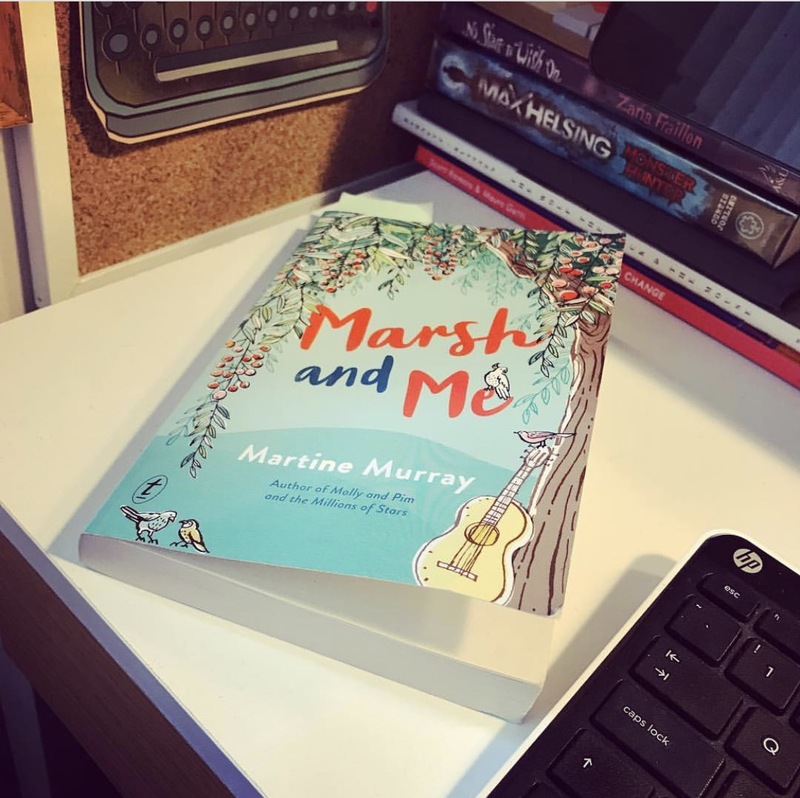 Edit: I read Marsh and Me in November and I am now just posting the review (life got in the way), I’ve now also finished reading Molly and Pim and the Millions of Stars. 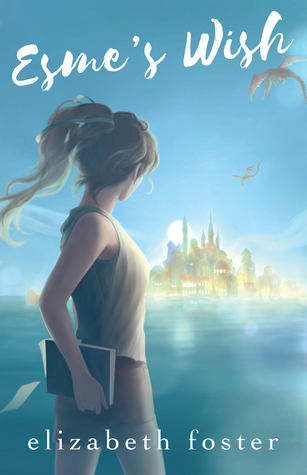 It is a story about friendship, family, being your best self and having a connection to the world around you. 4/5 adorable stars.